Just Add Polish: Day 11 We've got some stripes! And yay hoops! That silver holo one looks really awesome, and this one on your FB page is super drool-worthy! super cute and girly! 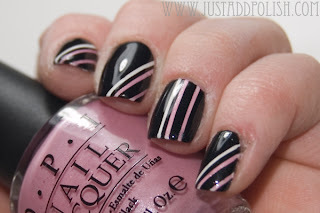 i love it and i need to get myself some striping tape soon so i can try all these cute manis!! cute! I haven't played with striping tape yet but need to!